Guess what time it is? No, it's not Adventure Time (and yes, I watch that show cause I'm a Finn-head). It's time for another giveaway hop. 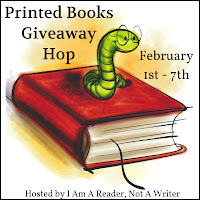 The Printed Books Giveaway Hop has begun. Hosted by Kathy at I Am A Reader, Not A Writer, this hop has over 100 blogs offering prizes. Our giveaway is open to U.S. residents only (due to postage costs) and runs through February 7th. I love fairies. They're very whimsical. But Dragons are also a big draw--very mysterious and regal. Then there are witches. I mean, who doesn't want to have magic! And then... well, I really love fantasy, lol. I love the fey. There are so many different ways they can be written that it is always interesting! I do love Angels, but then Witchy magic beckons. I love angles the best! I still love vampires the most. I like werewolves!! Thanks for the giveaway!! Fairies, vampires, and witches. Sorry couldn't pick just one! I'm going with the old faithfull, vamps. Thanks!! I'm on the fence with Fairies and Vamps can't decide between the two. Shifters! Wolves, leopards, whatever! I like em all! I have two favorites that I love equally: faeries and vampires. My two favorite supers are faeries and elves. 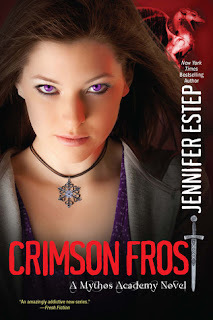 My first love is Vampires!! And then Witches. Both are just about equal. Thank you for a chance to win and for being a part of this fun and awesome blog hop!! Witches or Demi-gods are two of my favorites! Angels. I like Elves, Trolls, Sprites and all the world of fairies too. Pretty much all of them. I do have a collection of dragons though. I love pretty much any of them, but I love stories about witches. I'm on an Elf kick right now, but gargoyles are a favorite of mine, as well. My favorite has to be witches. I've always had an obsession with them for some reason. Of course, close behind is the vampire, and any were-critters. While I grew up with my mom loving dragons, I prefer werecats, all kinds (panthers & jaguars are favs though). Vampires! Thanks for the giveaway! !